Batley Bulldogs will aim to pull off a major shock as they bid to topple Bradford Bulls in Sunday’s Yorkshire Cup Final at Mount Pleasant (kick off 2pm). Bradford won promotion back to the Championship last season, under the guidance of former Batley coach John Kear, and are among the pre-season favourites to challenge for promotion to Super League this season. Bulldogs coach Matt Diskin believes his side will go into the game as big underdogs, despite having home advantage, but he is relishing the prospect of picking up some early season silverware. 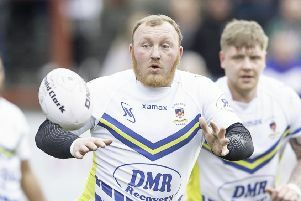 Diskin’s Bulldogs have beaten Hunslet and York on their way to Sunday’s final but face a step up in class when big spending Bradford arrive. Diskin said: “We are coming up against a Bradford side who are hot favourites and who have a four, five, six or seven times the budget we have. “They have got some fantastic individuals and have a big squad to choose from. “To be in a final, whatever value you put on it, is a good achievement and gives us the chance to win some silverware before the season starts. “The competition has given teams a real benefit going into the start of the year and you are battle hardened straight away rather than racking up big scores for or against you. “There is a piece of silverware at stake and you want to make sure it is in your cabinet. The pre-season competition involving eight clubs has received support from coaches, players and supporters alike and Batley are hoping for a big crowd at Sunday’s final. Diskin added: “It has been a great concept to gain exposure for the Championship.